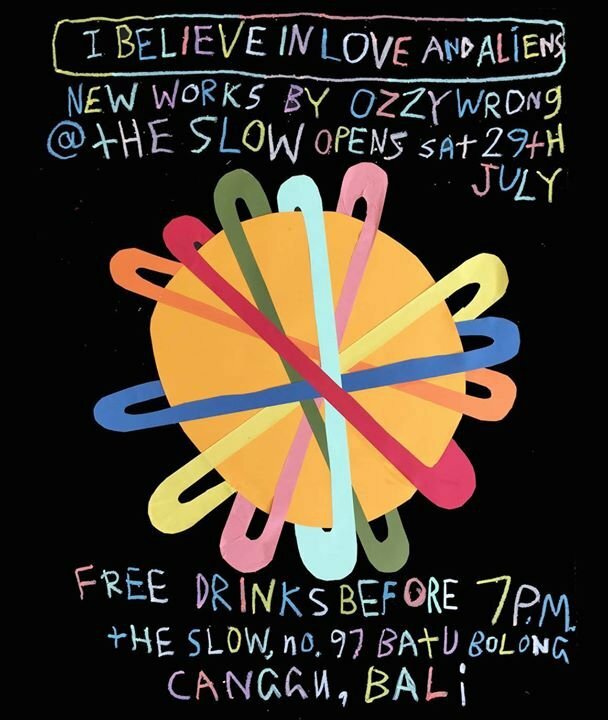 Join The Slow for the launch of Ozzie Wright - I believe in love and aliens. The infamous professional surfer, musician and member of punk-rock band The Goons of Doom, film-maker and insane artist, Ozzie Wright is show casing his latest works at Room 13 at The Slow, from July 29. Influencing the surf, art and fashion world for over 20 years with his style, talent and recognisable technique, Ozzie’s artwork is a mix of graffiti, pop art and manga that has been featured throughout Volcom fashion, surfboard graphics and designs, as well as numerous exhibitions he has held worldwide. Adult themes mixed with kid collaborations ,heroin addicts, spotty cats, girls ,Reapers and cars ,crayon everywhere. With all the works cosmically created in only two weeks no idea was too stupid. Infact it couldn't be stupid enough. Also featuring some live music by Mylee Grace of 'Mylee and the milkshakes 'and Vaughan Dead of the' Goons of Doom' and maybe even Ozzy Wrong of 'Mylee and the milkshakes ' and 'Goons of Doom'.